You don’t need to be afraid of grammar and literature any longer. Analytical Grammar is here to help you every step of the way with tried & tested curriculum that your children will actually enjoy. Plus, you won’t have to teach grammar all year to get results! Authors, Robin Finley and Erin Karl are women “on a mission” to make sure that grammar is more than just another worksheet completed, and literature is much more than a fill-in-the-blank exercise. The TOS Review Crew has been enjoying their systematic approach to language mastery with their family of products. Designed to sequentially and logically teach concepts including: grammar, punctuation, and usage, to mastery level. This program allows you to cover 34 units in 3 years. Ideally, 10 weeks of grammar instruction are followed with Reinforcement and Review for each year of study. If you are starting with an older student, you can easily adapt the schedule to finish the course in one or two years. Optional DVD companions feature Robin and Erin teaching the concepts directly to your student. This course can be independently studied by your student, but you may want to learn along side them! 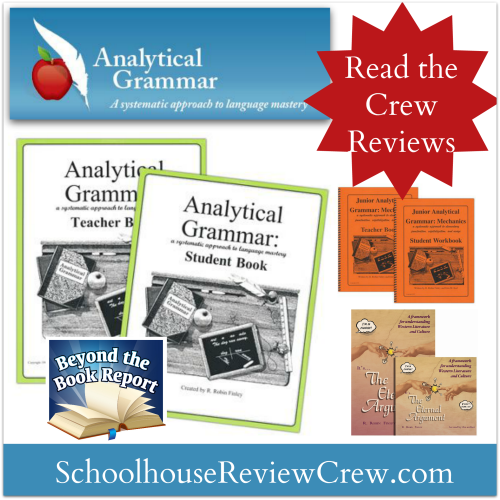 This program builds a strong analytical approach to grammar in your 4th and 4th grade students. 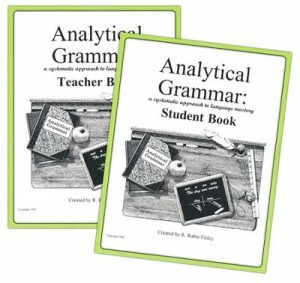 Junior Analytical Grammar introduces basic grammar materials over 11 weeks of instruction. Each unit builds on the next, providing a strong foundation. Covering parts of speech, sentences and early diagramming, the focus is on concept mastery. 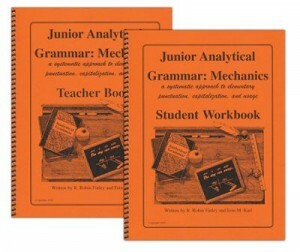 Following Junior Analytical Grammar, your student is ready to move to Junior Analytical Grammar: Mechanics. This 15 unit book focuses on instruction in punctuation, capitalization, and usage. Optional DVD companions are available to provide video instruction for those wanting extra help in presenting these concepts to their students. Their NEW middle school/high school language arts curriculum. This 3 year program teaches literary analysis and writing exercises. This program works seemlessly with Anayltical Grammar to provide a comprehensive language arts curriculum, in just about an hour a day. It comes with a teacher packet including a step-by-step teaching schedule and guide, examples of all the student work, and a glossary of terms with a DVD which will contain the video instructions, video lectures, and PDF rubrics, activities, and assignments. This book will help you and your students do more than just fill-in-the-blanks and move on when enjoying literature study. 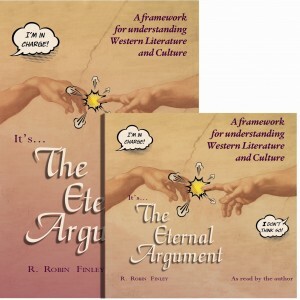 After teaching 8th grade language arts for 34 years, author Robin Finley believes that western literature is really one long, on-going argument. Filled with practical discussion questions along with historical and literary examples – this book builds a framework for teaching, understanding and discussing western literature with a Christian worldview. You and your student will be ready to enter The Eternal Argument with meaningful and lasting discussion after reading this book together. A big thank you to Renita Bentz at Mom of Many for writing this introductory post.